One of my favorite side dishes of summer used to be potato salad so I have tried several attempts at finding a substitution. So far, this is my favorite. It looks somewhat like the real thing, and the flavor is close, especially if you let this salad sit in the fridge for a day to allow the flavors to blend. Break or cut the head of cauliflower into bite-sized pieces and steam them until tender. Put them into a large mixing bowl. Chop the eggs, onion and pickles and add them to the bowl. 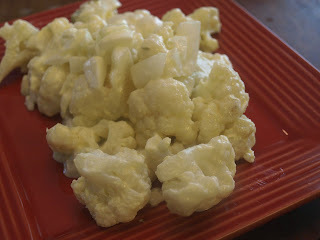 In a small bowl, combine the remaining ingredients and add the dressing to the cauliflower. Taste and adjust the seasonings, and add more mayo or vinegar if you want.